The dash and the user menu show garbled text (incorrect encoding). Attached screenshot shows an Edubuntu Oneiric live session in German where e.g. 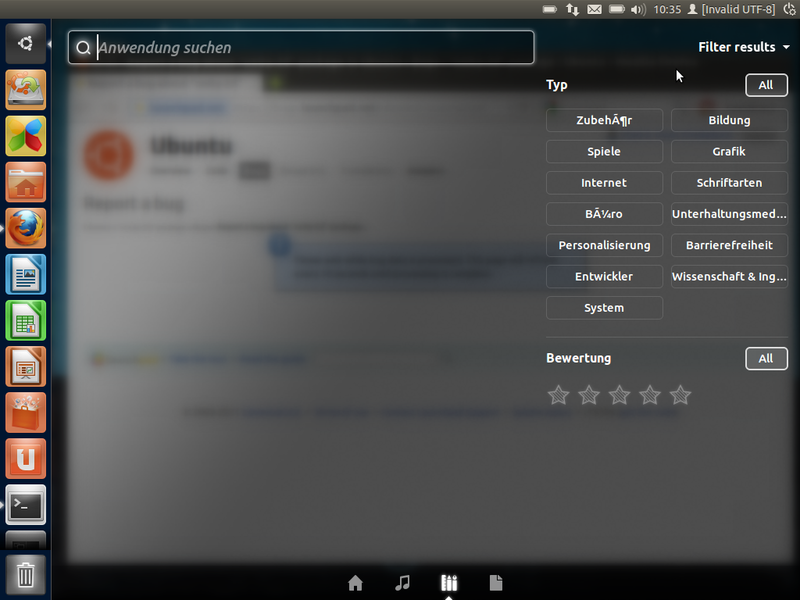 the applications filter in the dash shows "Büro" and "Zubehör" garbled. I don't believe the "Invalid UTF-8" user name from bug 834137 is relate to this bug here, because that bug there occurs even in an English desktop session. Updated the description to remove that point. This bug here is about the garbled text in the dash that occurs in a German desktop session (no other languages tested yet). Yes, this bug is indeed different from bug 834137: looking at the duplicate bugs, one can see that the "[Invalid UTF-8]" issue is not there. So it seems that there is an encoding problem in the dash itself.